A pretty striped melon, Crimson Sweet brings a smile to every summer gathering. 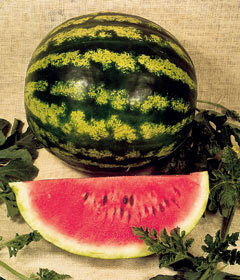 You just can’t resist the slices of this sweet, high-sugar watermelon. Since it was released in 1963 with good disease resistance, it’s become a classic favorite in America. Juicy red flesh with black seeds.